Behind the Ever-Expanding American Dream House The size of a typical American house has more than doubled since the 1950s. Why do we need an office, a wine cellar, a sauna and a room for the flat-screen TV? And what does it say about our culture? 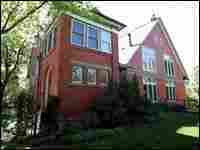 How does Frisby's house stack up to other McMansions? Scroll down to find out. 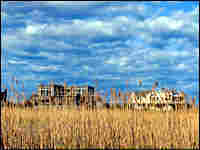 A view of farmland in the Hamptons. Encroaching McMansions are changing a once-pastoral landscape. 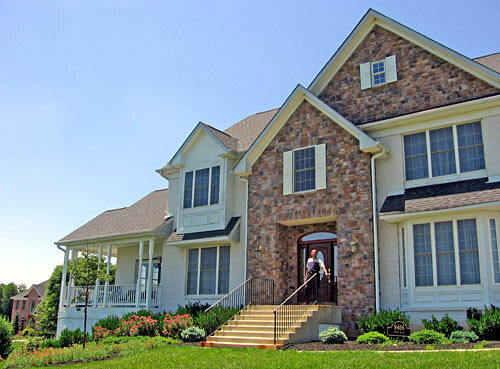 Michael Frisby bought his 11,000-square-foot home on 3.5 acres of land in Fulton, Md., for about $1 million in 2001. How much will comparable McMansions cost you in other parts of the country today? Photo: Bill Goodacre/ Goodacre & Co.
Photo: Barbara Bornstein/ Allan M. Schneider Assoc. If you want to see a big house, come to the home of Michael Frisby, a former White House correspondent for The Wall Street Journal who now runs a public relations firm, Frisby & Associates. The house in Fulton, Md., between Washington, D.C., and Baltimore, is 11,000 square feet and sits three stories high on three-and-a-half acres. Its amenities include an English garden, a wine cellar, a master bedroom larger than many apartments, a spiral staircase, a music room, a gym, a sauna, a steam room, and business office. And then there's "the room:" a major entertainment center with a 10-foot-wide screen for movies, top-of-the-line projection equipment, a bar and huge leather lounge chairs. "I believe that you can live out your fantasy," Frisby says. "That is what I'm doing. That is what my wife is doing. That is what other people are doing when they build or buy a house like this." Frisby's house is big, but it's not alone. 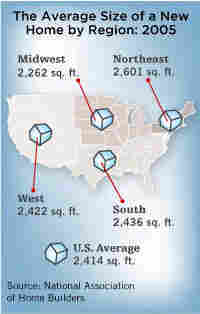 The average American house size has more than doubled since the 1950s; it now stands at 2,349 square feet. Whether it's a McMansion in a wealthy neighborhood, or a bigger, cheaper house in the exurbs, the move toward ever large homes has been accelerating for years. Consider: Back in the 1950s and '60s, people thought it was normal for a family to have one bathroom, or for two or three growing boys to share a bedroom. Well-off people summered in tiny beach cottages on Cape Cod or off the coast of California. Now, many of those cottages have been replaced with bigger houses. Six-room apartments in cities like New York or Chicago have been combined, because upper-middle-class people now think a six-room apartment is too small. Is it wealth? Is it greed? Or are there more subtle things going on? 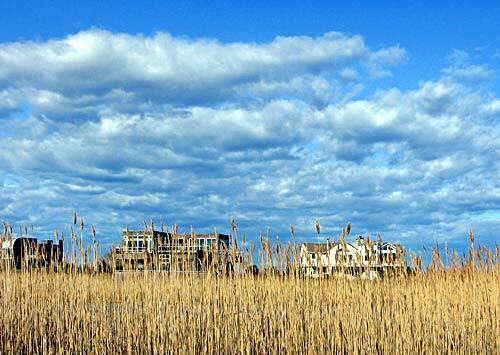 Out on the eastern end of Long Island, New York, big houses are replacing small ones, often transforming the landscape, replacing farmland and open spaces. Some of the old-timers in the Bridgehampton area don't like what they see. "I feel that my view is being literally stolen from me, and I resent it," says Sandi Fergerson, a local environmentalist. "I take pleasure in driving down a road and being able to participate in what's pretty, and I have to tell you, a great big, brand new house, ugly in most cases, right near the road, that cuts off my view -- I feel as if something has been taken from me." When asked to speculate on why houses are getting bigger and bigger, Fergerson and her dining companions at Bobby Van's, a classic, old Bridgehampton restaurant, throw out dozens of ideas. Real estate agent Barbara Bornstein says land is so expensive, builders have no choice: They have to build big houses to make a profit. "You know, we are very tenuous," says local architect Ann Surchin. "No one knows when the next 9/11 will happen. 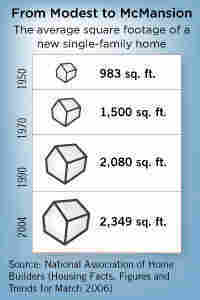 And these houses represent safety -- and the bigger the house, the bigger the fortress." Town planning-board member Jacqui Lofaro says that people who work in cities see bigger homes as a source of peace of mind. "If you have people coming out from the city, where they are bombarded by people, the tendency is to isolate themselves," Lofaro says. "Their house is their community. It is not the community's community, it is their community." Robert Frank, a professor of management and economics at Cornell University, says the growth of big houses is not really about greed. It's all about context. If you live in a village in Africa, even a modest American house seems huge. But in the United States, there are now millions of people with lots of money, and their wealth shifts the frame of reference for those just below them. So let's say you want to find the best school district for your child, but the houses there are huge and expensive. You might take fewer vacations, endure a much longer commute, save less. But you don't forgo the bigger house, because it means a better neighborhood and a better education. This is a deeper phenomenon, Frank says, than keeping up with the Joneses. "This is about what we feel we need as a function of the context in which we live," he says. "We know that when everyone stands up, no one gets a better view. We know there are all sorts of situations where individual choices that are perfectly rational add up to a total outcome that none of us likes very much. This is one of those." Whether or not Frank is right, many people out on Long Island understand that there are plenty of contradictions in play here. For example, they may know they hate big houses, but they may need them. "Big picture is, they are fueling the local economy," says Pat Trunzo, a local builder. "They are providing jobs for my family and the people who work for my family. We enjoy doing this very much, and doing it on this level -- high end, sophisticated homes." Trunzo clearly loves his work. He takes out a book of photographs of very large houses by the architect Robert Stern. Trunzo built several of these homes, and he is proud of them. The largest is more than 30,000 square feet. It has 21 bathrooms. "Every bedroom has its own private bath, so that gives you so many," he explains. "Then, near the public rooms downstairs, there are powder rooms. One of the crazy things they did was [decide] that the kids needed a little flat-screen TV in their bathroom." Trunzo says there's a different mindset among the wealthy today, compared to when his father started the family business. "Most of the big houses were visible from the road," he says. "You didn't wall yourself in with hedges and hide." Now, he says, the wealthy "want their own private little enclave. And they don't even want the general public to know that they are there." For Trunzo, it's just a bit strange. But for John Stilgoe, a professor of landscape history at Harvard University, it's emblematic. "The big house represents the atomizing of the American family," he says. "Each person not only has his or her own television -- each person has his or her own bathroom. Some of these houses are literally designed with three playrooms for two children. This way, the family members rarely have to interact. And the notion of compromise is simply out one of the very many windows these houses sport." Another critic is John Halsey, president of the Peconic Land Trust, an organization that tries to protect open spaces and agricultural land. For Halsey, the "Big House" is all about the American lifestyle: how we live, what we drive, and how we fail to appreciate the finite nature of land and energy resources. "Who needs 15,000-square-foot houses?" Halsey says. "I worry about the future of a culture and a society that has this extent of excess in it. I think there is a disconnect, and we are in a bubble. Somehow, we are just not experiencing the realities that the rest of the world is." Michael Frisby says having lots of room is a good thing. Look, he says, his wife grew up in the projects of New Haven, and he grew up without much. He always shared a room with his brother. "I always wanted a house big enough that my kids could be in their room screaming, and my wife could be in a room screaming, and I could be somewhere else and not hear any of them," he says. "And I think I have accomplished this with this house, because this house is so big that everyone has their own space." He says he agrees with analysts who say your big house becomes your community. He says he was always the party guy, and now there's no reason to go out. And he agrees about the fortress mentality after Sept. 11. So why do people want big houses? "I think everybody has their individual wants," Frisby says. "This is my dream. And let's face it: In America, in this day and age, many of us have gotten to the point where we can do this."